Not long ago, Vivo launched the X27 and X27 Pro series phones, which cost 3198 yuan ($476.52). Although the memory, battery, fast charge, and three-shot configurations are not bad, the processor is still 675675, 3,998 yuan ($476.52) X27 Pro. SnapDragon 710 processor, Xiaomi last year’s mobile phone is less than 2000 yuan in the use of this processor, so Redmi red rice president Lu Weibing also mocked a friend is not kind. In terms of processor selection, OPPO’s philosophy is similar to that of Vivo. The upcoming Oppo Reno phone has a Snapdragon 855 processor and a 10x zoom blessing, but that is a high-end version. The standard version does not have a 10x zoom. It is also the Snapdrgon710. For processor selection, OPPO Vice President Shen Yiren said that this generation of Xiaolong 710 is almost the level of Xiaolong 845. 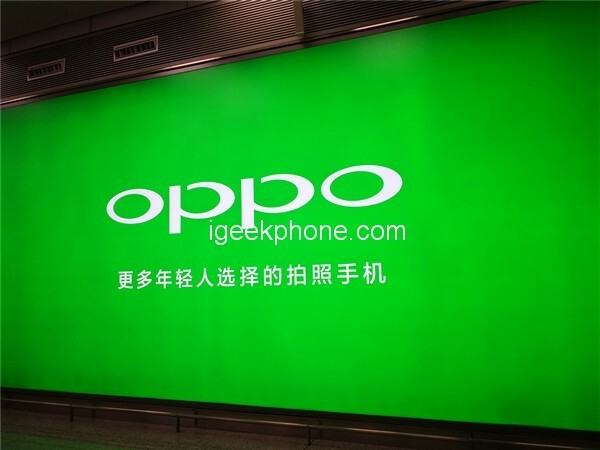 Since 2019, the biggest change between OPPO and Vivo has become “Internetization”. Not only have a number of cost-effective mobile phones been introduced, but also more and more live in Weibo marketing, like the previous years. Xiaomi company, the executives personally broke the news, no KOL earned the difference, OPPO vice president Shen Yi people now played such a role, this time has announced a lot of new brands Reno mobile phone broke, and also played with friends Xiaomi several times The saliva is rampant, such as for cost-effective, DXOMark scores, and more. OPPO’s new Reno phones were released early next month. The reason why it was one month later than other homes, Shen Yiren explained that this is for more stocking, the first batch of stocking has 2 million units, there will be no problem of buying. As for the configuration of Reno mobile phone, this time the official leaked the news, the Snapdragon 855 processor, 4000mAh battery, 10 times hybrid zoom camera, the main sensor is Sony IMX586 48 Megapixels. But this version is a high version, the expected price is 4000-5000 yuan ($596.02-745.02), and the standard version configuration is not so luxurious, you can be sure that there is no 10x hybrid zoom lens, there is no Snapdragon 855 processor, using Snapdragon 710 processing It retains Sony’s 48-megapixel camera sensor. 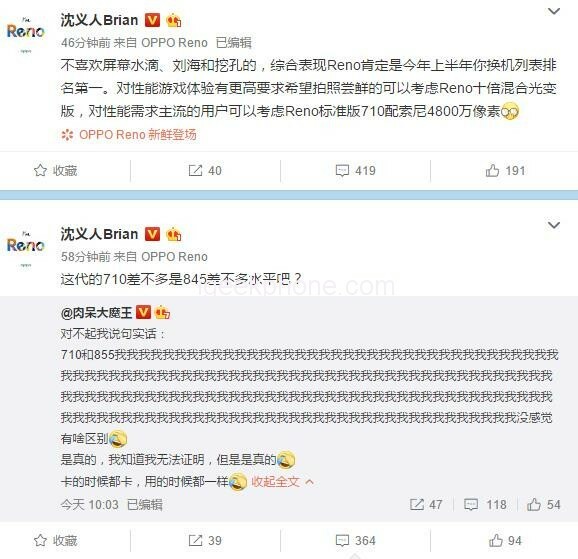 .Shen Yiren’s statement also means that another home Snapdragon 710 has created a flagship mobile phone manufacturer (although it is a secondary positioning in the flagship mobile phone), but many people are not satisfied with the Snapdragon 710 processor and feel sorry for the Reno mobile phone. Positioning and selling price. In this regard, Shen Yiren forwarded a microblog that said that the difference between the 710 and 855 processors could not be experienced. It also comes with a sentence – this generation of 710 is almost the same level as 845? This sentence is estimated to set off a bloody hurricane. For OV two, using the Snapdragon 6/7 series processor to build a high-end mobile phone is a normal operation. It has been so many years ago, and Qualcomm is the most affected. One of the welcome processors, the Snapdragon 660 R&D is also included in the OPPO credit. In the past, Qualcomm did not pay attention to the mid-range processor, and the Snapdragon 660 processor was a transformation. 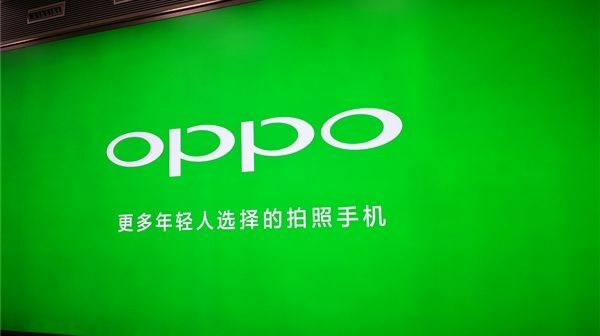 In addition, Shen Yi also mentioned other features of the Oppo Reno phone, such as NFC and Hi-Res HD standard support. Next Article Xiaomi Mi Notebook New Product Exposure: Releasing Tomorrow!